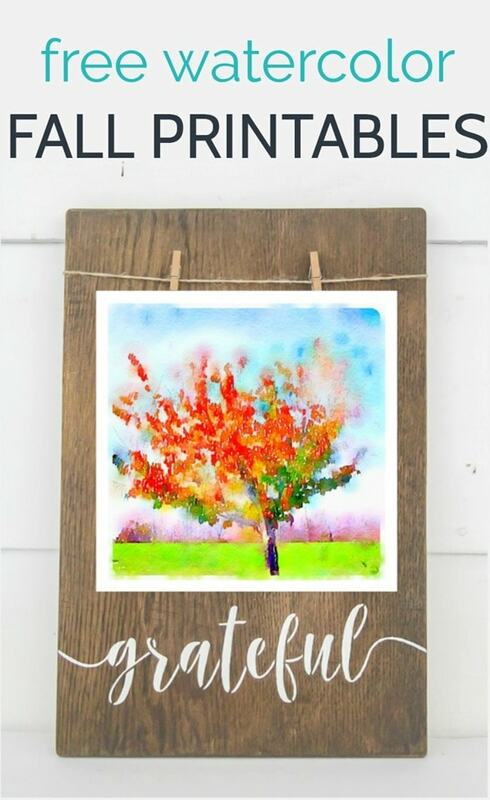 Free Fall Printables: Gorgeous Watercolor Trees - Lovely Etc. I have another great set of free watercolor printables to share with you today. 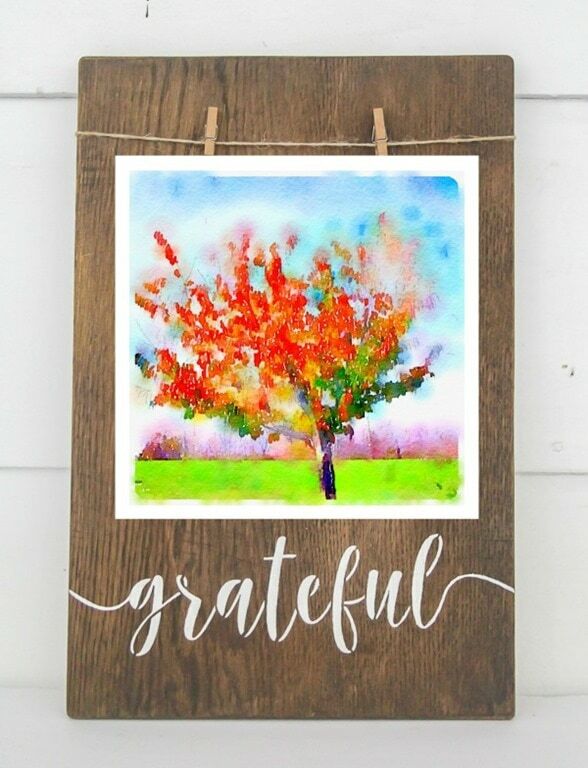 These printables are all about the gorgeous colors of fall. I’m sharing a set of watercolor trees in all of the best fall colors. And I added a sunflower as well because big, beautiful sunflowers always make me think of summer fading into fall. These fall printables make such a beautiful, easy way to decorate for the changing seasons. Just print them out and pop them in a frame. Done and done. I also invited some of my favorite bloggers to join me in sharing their own free fall printables today. Be sure to check them out below. I absolutely love them all and am having a hard time narrowing down which ones I want to print out for myself! These watercolor trees that I’m sharing today actually began with a hobby I was into almost a decade ago. That was when I first started collecting vintage cameras and I found out about a really cool way to use vintage cameras to take photos without having to deal with buying and developing film. 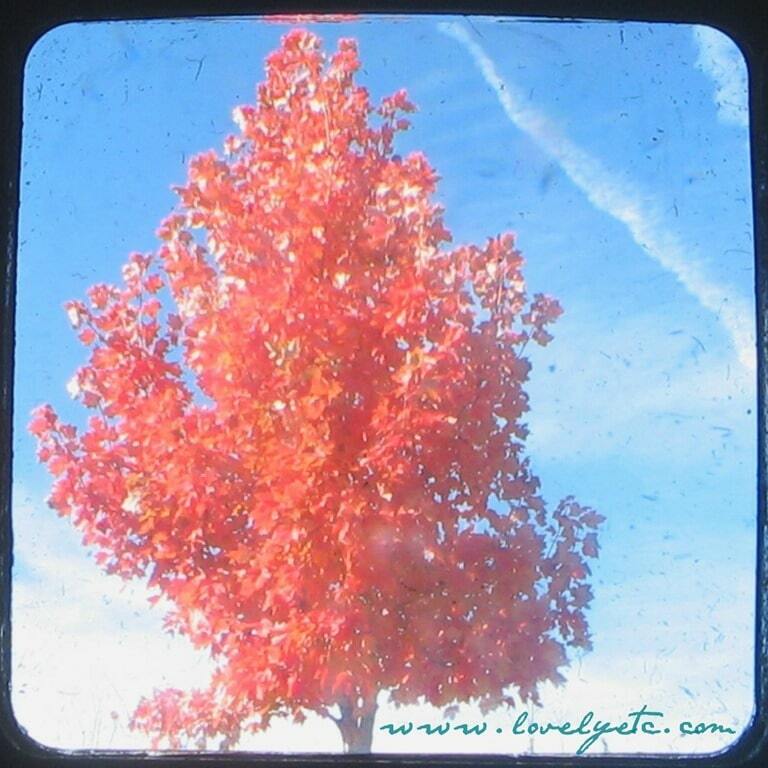 It is called “through the viewfinder” photography or TTV. Basically you use a digital camera to look through the viewfinder (eyepiece) of an old vintage camera and take your photos that way. It gives the photo a really unique, vintage feel because of the curve to the viewfinder as well as all of the dust that inevitably builds up inside the camera. You do have to make a special contraption to help block outside light and get the right focal length, but otherwise you just shoot and hope for the best. I really enjoyed trying out TTV for awhile, but eventually other interests took over. Plus, Instagram and all of it’s vintage-style filters came along. Once you could mimic the cool retro look of TTV with the touch of a button, it lost some of its appeal. But, during that time, I took a series of photos of some really gorgeous fall trees. We have beautiful falls here in Virginia and I remember that year the leaves were especially bright and colorful. Around that same time, I also took some TTV photos of sunflowers against a bright blue sky because they were just too pretty not to. 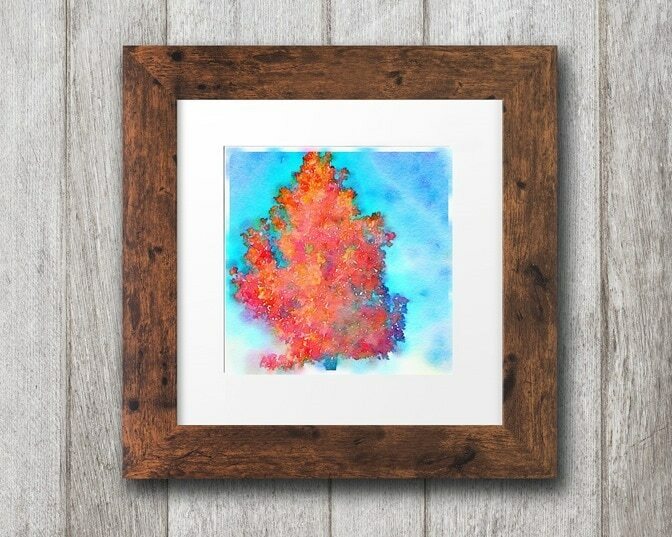 When I started thinking about making some new fall art, I remembered those beautiful tree photos sitting on my hard drive and decided it was definitely time to do something with them. I think this set of four fall printables would be amazing as part of a gallery wall. 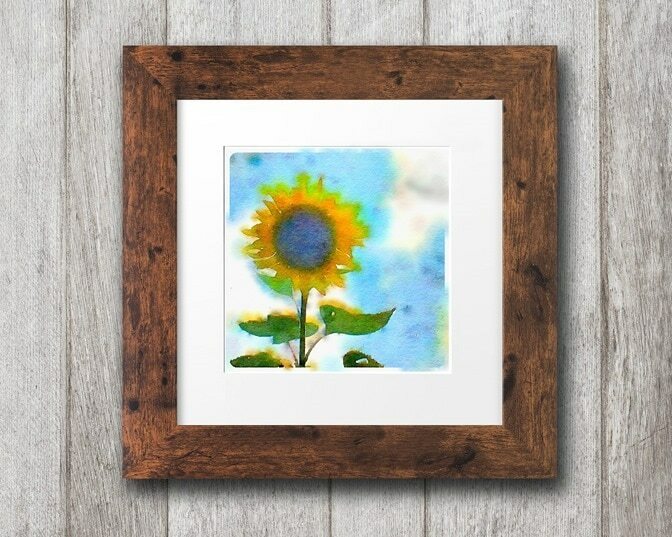 Or simply print your favorite and stick it in a frame. 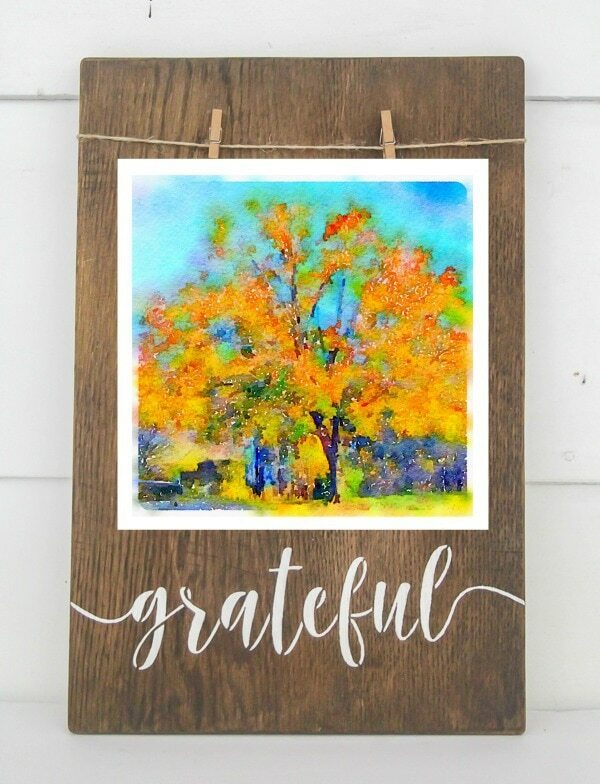 I especially love how they look clipped to the grateful frame I recently stenciled. Perfect for fall. Ready to see even more gorgeous fall printables? Each one is absolutely free; just follow the links to snag your copy. 5 Free Fall Printables from Happily Ever After, Etc. I’d love for you to spread the word about these free printables by pinning them on Pinterest. I am loving watercolors and these are just beautiful! I love that they are bright and still capture the beautiful colors of fall! Thank you for sharing! So pretty! I love the bright colors in your wall art! I love these watercolor printables – just gorgeous! Beautiful watercolors… they make the fall tones look even more magical! Thanks for planning this printable fun! I absolutely love photography and have taken quite a few classes (both digital and film) and I’ve never heard of TTV… it looks really fun and vintage. I love how you’ve taken those old photos and turned them into watercolor printables, that’s so much fun! Thanks Kati! The Waterlogue app is one of my favorites too. I’ll never be a great watercolor artist (probably) but I can use the app with the best of them! I love the colors in these! Thank you! Fall leaves really are amazing!